(Central Islip, N.Y., March 7, 2018) – The Long Island Ducks today announced the signing of right-handed pitcher Jair Jurrjens. The former big leaguer will begin his first season with the Ducks and 16th in professional baseball. 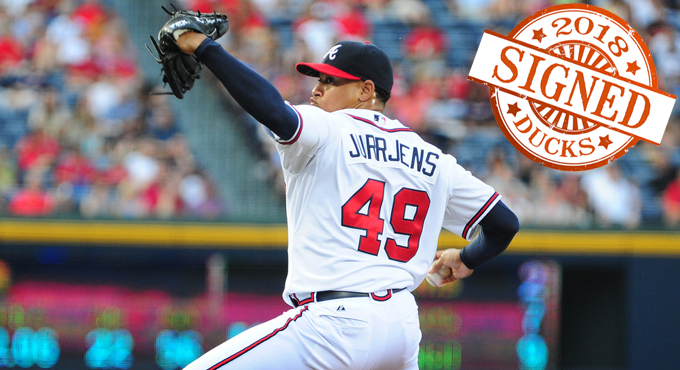 Jurrjens spent eight seasons at the Major League level, including five with the Atlanta Braves (2008-12) and one each with the Detroit Tigers (2007), Baltimore Orioles (2013) and Colorado Rockies (2014). In 130 games (128 starts), he compiled a 53-38 record, a 3.72 ERA, two complete games and 514 strikeouts over 767 and one-third innings. The Curacao native finished third in National League Rookie of the Year voting during the 2008 season behind Geovany Soto (Cubs) and Joey Votto (Reds). The following season, he led the National League in games started (34) while ranking third in ERA (2.60) and ninth in innings pitched (215.0). The righty was selected to the National League All-Star Team in 2011 and tossed one and two-thirds scoreless innings of relief in the NL’s 5-1 victory at Chase Field in Phoenix. That season, he totaled a 13-6 record, a 2.96 ERA, 90 strikeouts and 152 innings of work over 23 starts. Additional honors Jurrjens has garnered include being named to the Baseball America Major League All-Rookie Team in 2008, a pair of National League Pitcher of the Month selections (September, 2009 and May, 2011) and consecutive Mid-Season All-Star selections in 2005 with West Michigan (A, Tigers) and 2006 with Lakeland (A+, Tigers). The 32-year-old began 2017 by representing Team Netherlands at the World Baseball Classic. In three games (two starts), he posted a 1-0 record with a 2.38 ERA, helping lead the nation to a semifinal appearance. He then made 11 appearances (10 starts) with Oklahoma City (AAA, Dodgers) during the 2017 season, going 4-3 with a 4.64 ERA and 44 strikeouts in 54 and one-third innings. Jurrjens was originally signed as an undrafted free agent by the Tigers in 2003.